New York Mills, MN (December 11, 2015) – Eclipsing tournament wins by Lund luminaries Al and James Lindner and Jeff “Gussy” Gustafson, the legendary boat builder recently unveiled a radical new 1875 Pro-V Bass boat during its August dealer meeting – a progressive boat blueprint that sets out to redefine the concept of the modern day bass and musky fishing vessel. 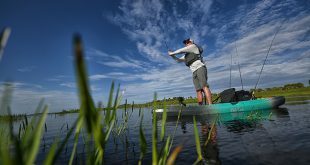 Designed and destined to tame waves from Lake Erie all the way to Florida’s Okeechobee, the Pro-V Bass reflects far-reaching research, development and pro-angler input. Infused with exceptional engineering, the original Pro-V Bass is built on Lund’s benchmark IPS2 aluminum hull. This superior framework features a flat center pad, multiple lift strakes and two reverse chines. The result is lightning quick hole-shot and a fast, stable, drier ride. 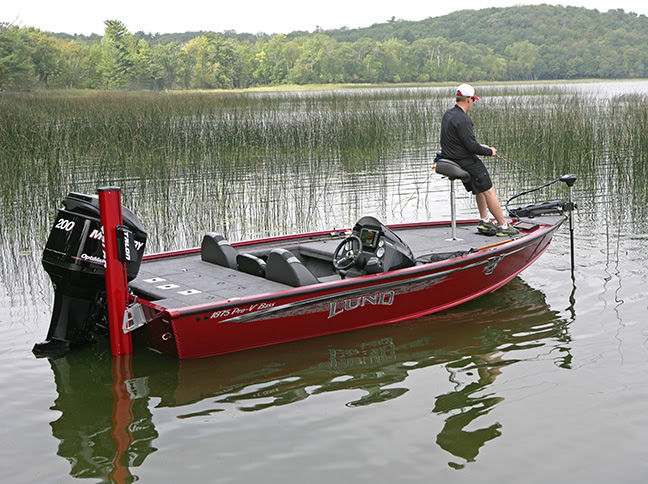 This boat comes in two distinct seating configurations—the classic bench-seating or the multi-species pedestal seating version—giving anglers versatile fishing platforms, based on personal preference. The bench-seating version includes recessed bench-seating and also features a patent pending extraordinary gas-assist tackle storage that literally rises vertically out of the back deck for unprecedented tackle access. Similar in fishability and function, the pedestal seating layout includes two swivel cockpit seats plus two additional “jump” seats, which flip up and instantly fold back down into the rear casting deck, providing ample seating for up to four anglers. Each boat has an in-deck 3-tier center rod locker, with individual tubes for five 9-foot rods, five rods up to 8’ 8” and five more to 8’ 4”. A built-in bump stick mount lies just to the left of the rod locker for taking snap measurements. Meanwhile, on the deck, four stowing rubberized rod tie-downs keep critical combos within easy reach. Tackle and gear storage is immense and intelligently engineered. The massive bow casting deck has four cavernous storage compartments, each built with Lund’s new patent pending Advanced Water Control deck system. Storage hatches are fully sealed, while any excess water is channeled down and away from the compartment itself, so tackle and gear stays drier. As noted, the bench seat version also includes a patent pending shock-assist pop-up tackle compartment under the rear casting deck, which accommodates nine additional 3700 size boxes. Sixteen more 3700s fit snuggly beneath the bench seat. Further to fishing features, the Pro-V Bass is available in a 24- or 36-volt battery configuration. A removable port console adds precious interior real estate, while a rear ski-pylon offers versatility for family watersport use. On the bow, a recessed, in-floor trolling motor foot-pedal slot allows for direct wiring or connection via plug-in. Recessed sonar mounts accommodate giant 12-inch screens, both on the bow and in the console. Maxed in quality, features and performance, the 1875 Pro-V Bass is set out to redefine the bass and musky fishing boat world. 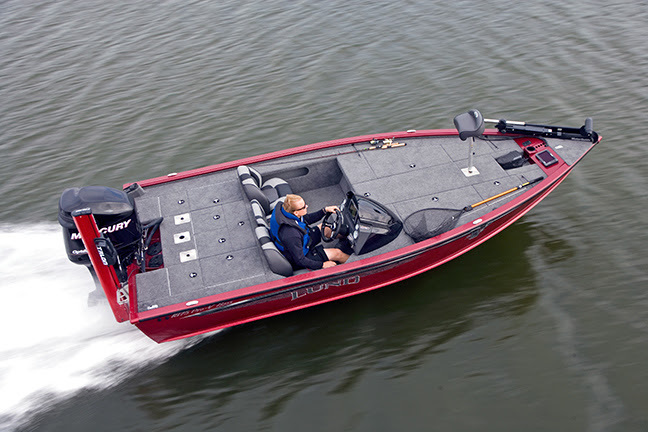 For more information on the new 1875 Pro-V Bass, or to shop Lund’s full selection of fishing boats, visit lundboats.com.